Could Boeing's 'Starliner' Spacecraft Be a Next Step for Reaching the Moon and Beyond? 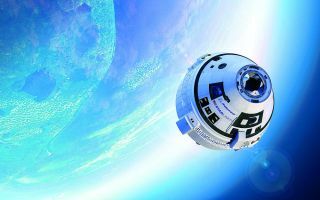 An artist's rendition shows Boeing's CST-100 Starliner heading for a rendezvous with the International Space Station. WASHINGTON, D.C. — Picture this: A team of space travelers blasts off from Earth in a fully automated shuttle that carries them to an outpost orbiting around the moon, where they will embark on a voyage to Mars. Though it sounds like science fiction, this fantastic journey may be closer than you think: An automated spacecraft designed to transport people into low Earth orbit could be ready for its maiden (uncrewed) voyage as early as this summer. The new spacecraft, called the Crew Space Transportation (CST)-100 Starliner, is being developed in partnership with NASA by a private company generally associated with commercial airplanes: Boeing. The Starliner is capable of carrying up to seven passengers as far as the International Space Station (ISS) in low Earth orbit. Starliner is intended to be the world's first commercial space vehicle, a reusable capsule designed for land-based returns. It will also be fully autonomous, to reduce training time for its crews, according to the project website. Starliner will initially carry astronauts and science experiments to the ISS, panelist and Boeing representative Tony Castilleja Jr.told the audience. The spacecraft's automated flight system requires only one astronaut to fly it, using tablets and touch screens to interact with the mostly self-piloting vehicle, said panelist Jim May, a Boeing software engineer. Starliner, scheduled to launch by the end of 2018, can carry up to seven passengers, or a mix of human passengers and cargo. Once Starliner has ferried people as far as the ISS, humans would be one step closer to establishing an orbiting base near the moon — the final outpost before the long journey to Mars, Castilleja said. That outpost could help launch missions that would first explore Mars from orbit and then eventually send researchers to the Red Planet's surface for the first stages of colonization, Castilleja said. Starliner will also bring experiments to the ISS that aim to improve life in space, refining methods for growing fresh vegetables and 3D printing tools and equipment parts, Alexandra Deal, a materials and process engineer for Boeing, told the panel audience. Engineers are also developing plans to build that proposed orbiting moon base, known as the Lunar Orbital Platform-Gateway (LOPG), or just "the Gateway," said panelist David Pederson, a Boeing systems engineer for LOPG. "We want to take what we've learned from the ISS and apply it to living near the moon," he said. Astronauts will use the Gateway as a testing ground for a more distant target: Mars. On the Gateway, scientists can develop techniques for insulating crews from intense radiation that does not reach low Earth orbit and the ISS. Working from the Gateway — about a five-day journey from Earth — will also be critical in learning to be "Earth independent," as Mars travelers would have to be, Pederson told the panel. Eventually, the Gateway could serve as a hub for Mars missions — as a fueling station and depot for ferrying Mars travelers to and from Earth and the moon, and as the launch site for flights to the Red Planet, Pederson said. Starliner's first mission — an uncrewed test flight, launched by the Atlas V rocket — is scheduled to take place as soon as August 2018, according to NASA.